The landscaping in your yard should provide interest year round, yes this does include fall and winter! While spring and summer provide a bounty full of different flowers in bloom, there are many plants that can provide interest (and sometimes even flowers) in winter as well. 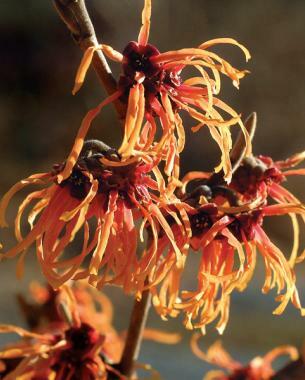 Witch Hazel – This tree looks great all year, but in winter it provides spider looking flowers in different shades of copper, yellow and even ruby red. What a great way to add color to a white landscape! 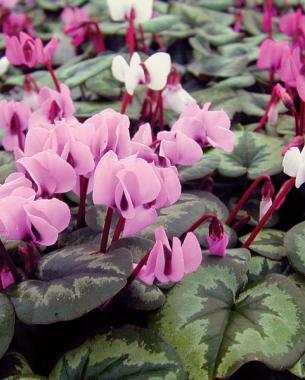 Hardy Cyclamen – In winter, or very early spring, colors of rose, white or pink small flowers come from the stems of this plant. These clump forming perennials are evergreen, and there leaves are even interesting, with a marbled look to them. 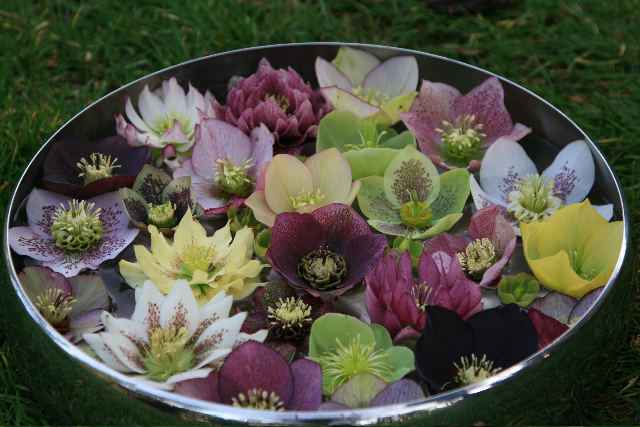 Lenten Rose – The lenten rose will provide a landscape with year round interest, but you will be looking forward to its bloom time and probably go outside in 5 degree weather just to see the blooms! Depending on the variety it can bloom from late winter and continue into spring. There are tons of varieties to chose from, and you will likely chose several, in different colors, because you can’t decide. Also, all of this plant is poisonous, so the animals will stay away, although I have had a few nibbles taken out of mine! There are many more winter flowering plants, there are also many more to chose from for winter interest; red twig dogwood, winter berry holly, daphne, rhododendrons, azaleas, and many more along with all the conifers we see. While we generally think of spring as the time to plant, fall is also a wonderful time to put plants in the ground. The ground is still warm allowing the plants to grow until the ground freezes. Just make sure that you keep the plants watered well until frost, and your plants can go happily into dormancy until spring. If you’re looking for some inspiration for your landscape that may be lacking in winter or fall, we would be happy to design something new for you! Check out some of our work on on Facebook, Houzz, Pinterest, Google+, and Twitter!